The Artus Leather Belt is an intriguing style of belt that is as functional as it is visually appealing. 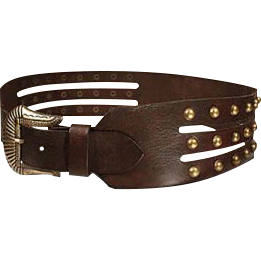 This buckle belt is made entirely from 100% leather and makes a great addition to almost any look, be it medieval, renaissance, or purely fantasy. The Artus Leather Belt consists of a 3-inch wide leather band that has been split into three narrow bands on the sides. Each of these leather bands is set with a horizontal row of round studs. The back of the belt remains a solid band of leather, which ensures the integrity and strength of this belt. At the front, the wide band is whole and sharply tapers down into a narrower band, which acts as the strap and the harness for the buckle. Even the buckle on this belt is decorative and ornate, being highly stylized and visually appealing. The belt only comes in brown but is available in four distinct sizes. Make sure you order by waist size in order to receive the appropriately sized belt. 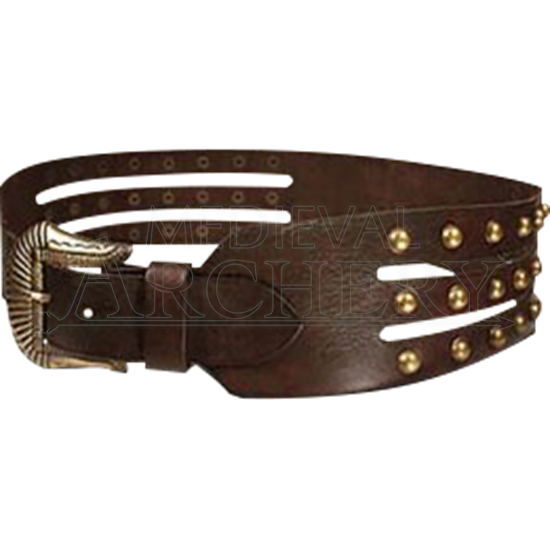 Despite decorative appearances, the Artus Leather Belt is a fantastic accessory to include with any look or costume. It is an attractive belt that is perfect for holding up your trousers, while supporting your sword frog, your tankard straps, and your belt-bags - basically, all the medieval amenities you might need.